The International Road Federation – India Chapter, in association with the Ministry of Road Transport and Highways, Ministry of Health and Family Welfare and World Health Organisation and with support of Maruti Suzuki, ADB, FICCI and ASSOCHAM had organised a one-day Conference on “Trauma Care – a National Mission”, as part of the 30th Road Safety Week (February 4 – 10, 2019). 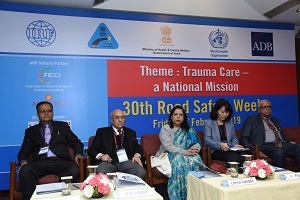 The Conference provided a platform for 2 Panel Discussions on the themes of – “Trauma Care Initiatives in India to save lives of road accident victims – challenges in the nationwide implementation” and ‘’Furthering Trauma Care – the Role of Corporates, NGOs and Start Ups’’. Animated by experts from the medical profession engaged in Emergency Medical Services, the first session came up with recommendations to enact supporting legislations such as Emergency Medical Services Act, Good Samaritan Law and policies, uniformly across India. The need for the creation of a nodal agency for trauma care which could shoulder the responsibility and be accountable was also stressed. Strengthening first aid trauma care through consistent Bystander Training was also identified as an important activity to be undertaken with the support of Corporates and other stakeholders. The deliberations also brought out the need for the supporting infrastructure and ecosystem to strengthen trauma care provision. The subsequent session on the Role of Corporates focused on best practices towards zero fatalities and also showcased Apps as a technology aid for trauma care providers. The Corporates also appreciated the need for extending their corporate social responsibility by adopting road stretches and areas in the vicinity of their operations by investing in training and mass awareness activities. To access the conference recommendations, please contact IRF.